Everybody has unlimited potential which mostly unrecognized and has own uniqueness. But not so many people discover their own authentic leadership character and build the empowerment process to bring unseen potential out. Many executives and being parents always would like to get my advice in choosing the right path for their children. One of them said her kid is so good in Tennis, Guitar, Painting, Physics and mathematics. What will be the right path for their son? I ask them back a simple question “They have many great skills but which one have support from their innate drive. 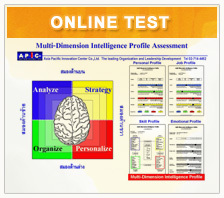 The right skill with the right innate drive is the key for strategic growth. The same principle is also true in the organization when you try to find the right path for your team. Listen with heart to find their innate drive is the critical skill for the leader of the future. Many organizations just promote good manager but fail to nurture the leader. They forget to let them practice to hear the insight from the heart. I organized “the leader of tomorrow” camp for of the leading Global Company who wants to provide the quality leadership program to their Super VIP Customers. Twenty families joined the program. We set up two camps. One for their parents and one for their children with their age are around 15-18 years old. At this age, it is the critical point to select their own destiny. In the children camp, we coach the discovery process in finding their own innate drive and build their own leadership blueprint. We taught them how to draw their picture of who they want to be when they grow up. Let them share from their heart to their peer group. And encourage the group to ask the tough questions on “Why Why Why” to link their dream to their current subject in school. This process sharpen their strategic thinking and turn them into practical dream with “What Why How” presentation package. At the same time, we taught their parents not on their IQ but on EQ especially in the area of listen with their heart to discover authentic leadership character of their kids. It is very difficult for these Super VIP customers not to listen with their head because they are so successful. These also create IQ trap in listening with their heart. 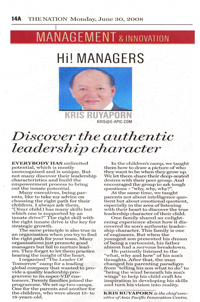 One family shares very enlightening experience in discovering their son authentic leadership character. This family is engineering family. His grandpa was the successful engineer graduate from University of California at Berkeley, U.S.A. His dad graduated from Top engineering school at MIT, U.S.A and his elder brother is now a freshmen at engineering school, Chulalongkorn Univeristy. From this heritage, you can imagine what will be his dad expectation for his youngest kid “Another Engineer”. The moment of truth was there when his kid did present his own dream picture which is not “Engineer” but want to be “Cartoonist” like Mr. Walt Disney. When his dad saw the picture, his nervous almost breakdown. His mom shook his arm and whispered in his ears that ‘Listen with your heart to connect to your son heart first before giving any comment”. His conscious is on top of his emotion. He sat down and patiently listen to “What why how” of his son thoroughly thinking. He told me after the camp that the process in helping his son discover their authentic leadership character make his son mature and build courage to speak from both head and heart. He, himself as a daddy changes his own paradigm from “telling his son what to do” into “being wind beneath his son wing” to help his son crafting his inspiration and support in developing skill in turning vision into reality.